There are three different types of buses on Barbados. The buses of the Barbados Transport Board, a state-owned company with a yellow stripe on a blue background, as well as the private entertained yellow minibuses and white maxitaxis, the latter also known as ZRs, are shared taxis on a fixed route. While the privately operated buses usually only travel in the populous areas to the west and south of the island, the Transport Board's buses travel the entire island, including popular visitor sites such as Farley Hill National Park, Bathseba, Harrison's Cave, Gun Hill Signal Station and Oistins. The island has 3 terminals, 2 in the capital Bridgetown (Fairchild Street and Princess Alice Highway) and one in Speightstown, which are used by all. The fare is $2.00 Barbados Dollars for adults and $1.00 for children under 18. $2.00 Barbados Dollars is 1 US Dolar. Foreign coins are not accepted. Only exact fares are accepted on the state bus routes. The private ones also give change, although usually large banknotes cannot be changed. While the state buses have a timetable, the private ones usually only travel when they are filled with passengers. Visits to petrol stations during the journey are not uncommon with private buses. Pay attention to the red, white and black signs indicating a bus stop. Passengers are only allowed to board and alight at these bus stops. 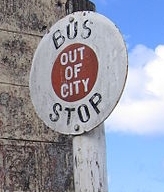 Get on to stop buses: To stop buses, give a hint to the arriving bus. The final destination of the trip is indicated above or on the windscreen. The state bus lines are additionally numbered. If you are unsure whether it is the right bus, the driver will be happy to provide information. Get off the bus: Some buses have front and rear doors. Mostly, however, there is only one front door in the driving direction left of the driver (left-hand traffic). If you don't know your way around, you should tell your destination to the driver, who will let you get off at the right place. The Transport Board also offers a scenic tour of the island every Sunday. This is an inexpensive way to explore the island and interact with locals.